LDT: What does your art express? Grace Igoe: My ceramic work aims to communicate and show awareness of the autistic condition. I use the form of human heads in my work because facial features are a vehicle for expression; the face tells us most about an individual’s mood, personality and state of mind. The use and application of colour, pattern and surface treatment reinforces these ideas. "I would like to highlight the beauty that comes within the condition." Through this I explore common traits and behaviours, such as difficulty expressing emotion, struggling managing changes and strong senses of not fitting within self or society. These issues are expressed through ideas of fragmentation, fracturing and dilemmas associated with touch and handling. We all might recognise some of these characteristics, so although coming from an autistic perspective, I aim to challenge perceptions, leading towards a better understand of the autistic condition, translating visually, physically and emotionally through engagement with my work. LDT: What does autism mean to you? Grace Igoe: That’s a hard one to answer, it’s not something I’ve given much thought too, as I live my life my way. I was undiagnosed for most of my childhood. The paediatrician I was under refused to label me with autism as she believed it would make me unemployable in my adult life, so when outside my home I had to hide many of my autistic traits from my peers, only being my true self in the comfort of home and surrounded by my family, who understood. As an adult I can now see how autism can effect daily life and employment. During my time as a student, I knew where I had to be, what I had to do and what I needed to take with me. Routine was key, as I felt if I had control and order in my life I had control of my condition. It has taken lots of practise and strategies to handle and structure my life to enable me to manage my many other traits of autism. I can’t hide what I have, so I now embrace who I am and more. Because I want people to see me for who I am and not what I am. I am comfortable with who I am, I am more than just a condition. LDT: Does your ceramic work have cathartic value? Grace Igoe: For me, producing my work on the theme of autism is a way for me to come to terms with the condition and express my feelings and experiences through art. Whilst attending my end of year degree show I was amazed to see the responses of some of the visitors to my work. One lady was looking at my piece “Resistance of Change” and commented “Oh my God, that’s how I feel.” Others saw themselves in the traits I was portraying. So I would say that for some my work has a cathartic value. LDT: It is often said that people who live with autism are well suited to creative pursuits – what is your view on this perspective? Grace Igoe: I have always loved to draw. As a child, I used my drawings as a way of communicating my day. As I got older art became a way for me to relax - both body and brain - and a means of escape from the hustle and bustle of life and the confusion it brought. So in a sense I have always had an artistic flair. I like to challenge the norm and push materials to their limits. I like to experiment and investigate. I come from an artistic family including builders, seamstresses and painters so feel it’s hard to say if we as autistics have the creativity because of the condition. How important is it to you to be seen as an artist first, rather than an artist with autism? This is very important to me. Nobody should be labelled, a person who has a talent should be recognised because of what they can do and not what they are. I wake up every morning and go to bed every night with autism, it will never go away. My art is something completely different, I am not autistic when I am making, I am me, creative, imaginative. LDT: Is access to creative training accessible to all, in your experience, or are there barriers that could be removed to make it more accessible? Grace Igoe: There is no account made for children with learning disability to enter further education to pursue a course they excel in. This is due to the government entry requirement of Maths and English GCSE level A to C to access further education. I luckily had the support of a very strong adult who saw what I could do and she fought for me every step of the way to allow me to pursue my creative ability, this meant stepping on lots of toes and fighting for my right to learn and succeed. Once our battle was won and I gained my rightful place in further education I had to prove my worth and my ability before being completely accepted. LDT: What are you working on at the moment and what are your plans for the year ahead? 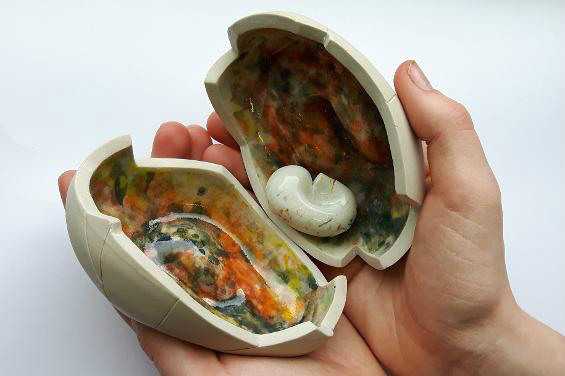 Grace Igoe: I am furthering my theme of autism by delving deeper into other areas of the condition and ways of translating the various aspects of autism, whilst experimenting with different techniques and methods through clay. My work will be developed towards exhibition and higher end gallery, so the public can spend time reflecting and engaging with my work. I am an Artist in Residence at Manchester College, where I provide workshops, tutorials and talks, whilst furthering my practice in ceramics. My work will also be appearing in the Shape Open, London exhibitions, during March to April, as well as other exhibitions in the UK during 2018. LDT: How can people find out more about your work? Is there anything else you would like to say to our readers or for our readers to know? I have spent most of my life not being able to be who I truly am, an autistic. Through my work I hope to open people’s minds to the different spectrums of autism, the traits and struggles that can rule the life of an autistic. I would like to rid the world of the stigma that surrounds us and highlight the beauty that comes within the condition.